Something is rotten. Or broken. Or wrong. These are the sort of headlines that the fashion industry has been touting recently, in its ponderous state of self-loathing. With all these existential doubts swirling around, it’s no wonder Karl Lagerfeld – never shy about voicing his opinions – gave his own riposte. Back in December, not long after the Paris attacks, Lagerfeld responded with a love letter to the city of lights, sent via Rome for Chanel’s Métiers d’Art show. With Chanel’s latest haute couture show, Lagerfeld sent a calming message that attempted to combat the cries of broken systems and rotten cores. Your eyes were immediately soothed by the architecturally pleasing slatted three-storey wooden pavilion, set in a minimal but striking garden, complete with floating lily ponds, perfect lawns and perpendicularly laid steps. The pace slowed right down as models emerged from Chanel’s zen zone in geta-esque wedges and serene elongated silhouettes of white, cream and beige. “It’s not about bling bling red carpet. These are clothes that are very easy to wear,” Lagerfeld said backstage. That’s easy in the haute couture sense, where someone might consider a free-flowing chiffon lame cape sprinkled with sequins with a matching strapless column dress effortless. This was the slowest of fashion – made in ways, of course, that directly and pointedly oppose mass production – being showcased at the slowest of speeds. Hold the headlines, though. To say Chanel has dived into the technically-bounded, green-patrolled arena of sustainable fashion would be misleading. Lagerfeld’s interpretation of “eco-couture” should be taken with a pinch of salt, especially from a company, who is yet to make a definitive and concrete CSR statement for their policies on carbon emissions, environment awareness and labour conditions. 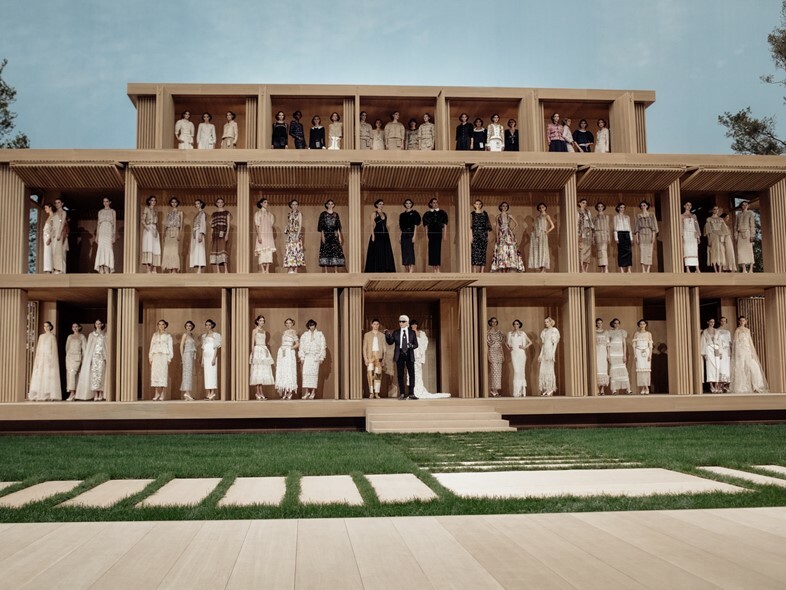 Still, for Lagerfeld to even attempt to employ the language of eco fashion and source materials that are indeed environmentally sound at a house that is at the very top of the fashion food chain, is significant. If the biggest players of fashion even begin to slowly inch towards change, then undoubtedly there will be a trickle-down effect. It sets, at least, some wheels in motion, and is of course timely after a year, where both Kering and Prada Group waded into the topic of sustainability. Lagerfeld did shy away from sweeping green crusading statements. Aesthetics will always reign supreme at Chanel. “It must not look like some sloppy demonstration stuff, you know,” he joked, in reference to the hemp garb that sustainable fashion has traditionally been associated with. On a more esoteric level, this back-to-nature approach can be seen as Lagerfeld’s will to assert the positivity that great fashion can bring about. The American biologist E.O. Wilson famously said, “Nature holds the key to our aesthetic, intellectual, cognitive and even spiritual satisfaction.” On these beautifully crafted clothes, quite literally the birds and the bees appeared in the form of intricate embroidery. Under an impossibly blue sky, in Chanel’s contemplative space of calm – which we’re assured will be entirely recycled – for a moment we could do a bit of blue-sky thinking ourselves. How can we fix what’s broken and rotten? Lagerfeld didn’t have all the answers but they were certainly throwing out a hint or two.